Need to improve your luck? Increase your odds success and happiness? Have a lucky spell cast in your behalf or keep a good luck charm at your side! You have nothing to lose. 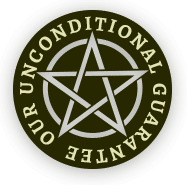 All Good Luck Spells from the California Astrology Association are risk-free: If they don't profoundly improve your life, we'll refund your money. Period. No questions asked. What is the key? What is the secret to having a lucky streak? Some psychics are able to provide lucky numbers, but only the truly gifted can tell you when to use them. Since it is evident that even these same lucky numbers will not work for you day in and day out, it is imperative you learn precisely when to use them! Burton's Ultra-Lucky spell instills the super charge that could thrust you to the pinnacle of success. This emergency spell affords you the opportunity to turn the tide, to bring things to you when you least expect them, to enjoy life to the fullest. Having a skilled psychic cast a Gambling spell in your behalf could dramatically alter the odds in your favor. This spell is designed to bring you the best luck, the fastest luck, the "ridiculous" luck to bring you all that you desire. The Dragon Gambling spell is designed to increase the odds in your favor not only at the gambling tables and in games of chance, but also in life. This spell dissipates the black cloud hanging over you, freeing you to enjoy the good life. It's time to take matters into your own hands. This spell points you in the right direction. This remarkable series of spells is designed to direct you to the "fortune path." This spell is designed to supercharge you, injecting you with that extra boost so you can attain success in the many phases of your life. If you feel you've been shortchanged in life and need a helping hand, this potent spell is designed to bring excitement to your life and dollars in your pocket. If you are the type who scoffs at the odds at winning big, this spell is designed for you! Burton will cast three spells simultaneously to help your luck and finances!